Ashtyn is sick. Very sick. She can hardly talk. Can hardly open her eyes. Can hardly walk. Can hardly sleep comfortably. She can’t eat. Can’t drink. Can’t laugh. Can’t cry. She listens. She understands. She does what she is asked. She communicates as best she can. She is kind. She says “please” and “thank you.” She feels peace. She feels hope. She feels prayers. She feels God and angels near. She is faithful. She is strong. She is patient. She is calm. She wants to go home. She will do what it takes to get there. Today we did all we could to try and ease what she is going through. Occupational therapy and physical therapy worked on her strength to do daily cares. Her aunt Wendy spent a couple hours doing guided imagery while listening to yoga music as she imagined herself away from her physical body. She was then able to imagine herself doing whatever it is she wants to do. We also used massage therapy, music therapy, touch, and silence. 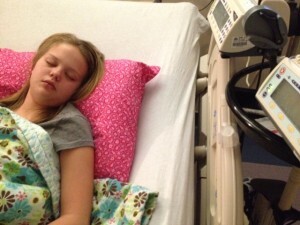 Ashtyn has had a temperature for over six days which is concerning the doctors. Each lab work that has been done continues to show no signs of infection. 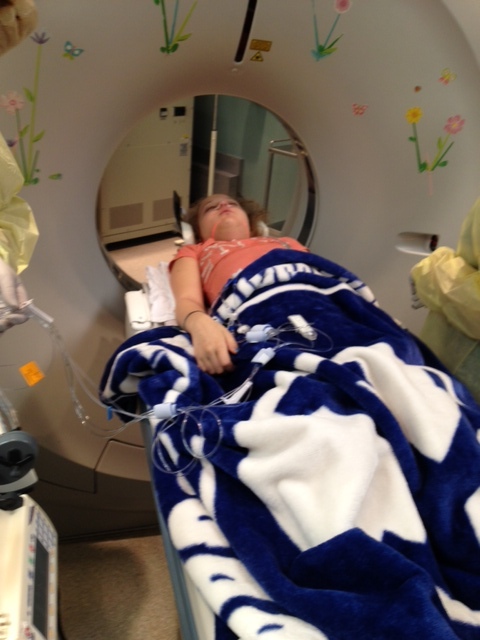 At noon she had a CT scan to discover whether or not a fungal infection is causing her high temperatures. The CT scan showed no signs of fungus. It did show left lower lung pnuemonia and appendicitis. At 7:30 pm a surgeon came to Ashtyn’s bedside and talked to me about the possibility of having her go to surgery to get her appendix out. The risks of surgery were high due to her low platlet count, her lack of white blood cells, and her overall post chemotherapy condition. The risks of not taking her appendix out were infection and decline in her health. I was told that the health care team would come to a consensus and let me know. I got very nervous. My hands shook. My heart raced. I cried. I texted family. I let Ashtyn’s Army know of her need for prayers. 1 ½ hours later the decision was made to not go forward with surgery. I understood their reasoning. Her mucositis is so severe that her appendix may be simply inflamed just like everything else. Even though she is extremely sick the oncologists think she is still reacting within the spectrum of chemo patients, just on the very severe end of the bell curve. The thinking was if they went forward with surgery and took out her appendix it wouldn’t help in her recovery from chemo. The doctors also felt that the risk of rupture wasn’t as high as a normal child because Ashtyn doesn’t have the white blood cells that normally help with inflaming the appendix to the point of rupture. Interesting. I asked family and facebook friends to pray that the doctors would do what needed to be done. I am grateful for the immediate response. At the beginning of the day I felt peace, and then I didn’t, and then I did, and then I didn’t. During the night I have felt peace. It is 6:30 am. Yoga music from Pandora played all night. She asked me tonight to lay with her because she sleeps better that way. She sleeps, goes to the restroom, suctions her mouth, sleeps, throws up, suctions her mouth, sleeps, coughs up mucus, throws up, sleeps, goes to the restroom, and on it goes. When she did fall asleep in my arms or next to me, I couldn’t help but get tears in my eyes laying next to this perfect earthly angel. I have always, from the time she was a baby, called her my Angel Ashtyn. Her soul has always been angelic to me with her tender kind heart, her desire to make people feel loved and included, and her testimony of God and her Savior. I am so proud of her as I know you all are. She truly is handling this trial with the most admirable character. Through the night I have reminded her how loved she is and what a remarkable example she is to us all. Today the doctors informed me that she has the worst case of mucositis, the worst side effects from medications, and the worst complications from chemo. 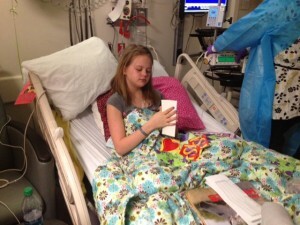 If other chemo kids reacted the way Ashtyn has, they would decrease the dose of which they give. She has the rarest form of Leukemia and has indeed been giving them a run for their money. I believe she will continue to do so. I believe she will go through her cancer course the way God wants and according to His plan. There is a purpose in her struggles. There is purpose in her taking the most difficult road. Good and bad days will come. I feel our faith will be tested and stretched to the max during her journey. There will be times when we will be tempted to lose our faith and let doubt come into our hearts. But I believe with everything in me that she will triumph. And when she does we will have no question how she got there and why she is alive. It will not be by chance and it will not be by coincidence. It will clearly and poignantly be because of God’s mercy and miracles brought about by the faith, prayers, and fasting from you. My prayers alone will not be enough. I know that to be true.